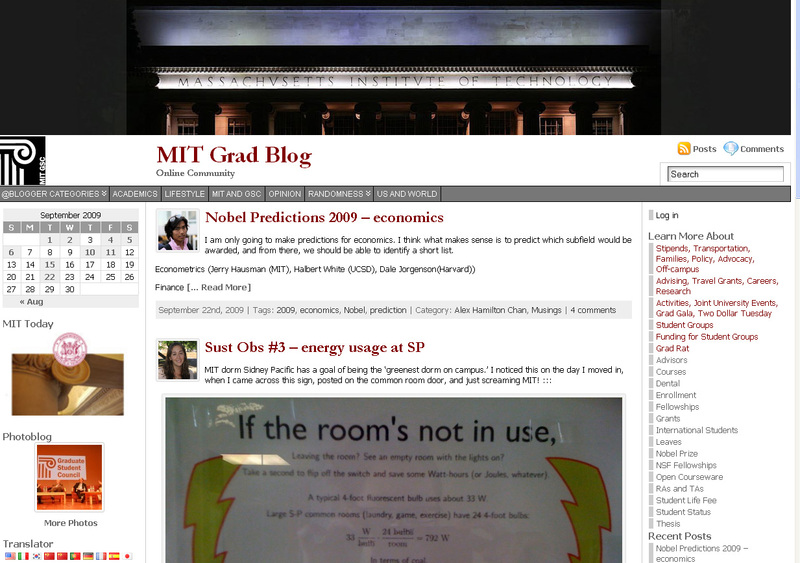 Curious about what life is like for MIT graduate students these days? Or maybe you’d like to connect with current grad students? You’ve got a few options. You can get a taste of daily life via the MIT Grad Blog, a new outpost of musings and information hosted by the Graduate Students Council (GSC). Follow GSC Alex Hamilton Chan’s predictions on who will win the upcoming Nobel Prizes in economics or get his tips for the best food in Boston. Find out how research is like riding the Cyclone at Coney Island –“the highest of highs and the lowest of gut-wrenching, vomit-inducing, white-knuckled, heart-beating-in-my-throat lows. Or just browse through the Humor section. Want to add your voice? The Graduate is looking for alumni to write and to be interviewed. Interested? Contact the editor: Anusuya Das, a PhD Candidate in biological engineering. Can’t figure out what to do tonight or this weekend? Think you’ve exhausted the local hiking trails or need somewhere fun to take the kids? Check out Goby.com (pronounced go-be), a new search engine developed in an MIT research lab by company cofounders Michael Stonebraker, an MIT adjunct professor of electrical engineering and computer science, and Mujde Pamuk SM ’07, a research affiliate at the Computer Science and Artificial Intelligence Lab. Goby searches through hundreds of prequalified databases for all things travel- and event-related nationwide: live music, restaurants, lodging, museums, outdoor recreation, tours, off-beat attractions, and more. Results are presented in a clear format with photos, summaries, and relevant info and plotted on a map. Goby uses deep Web technology, which, according to the Web site, “provides semantic organization and lends structure to unstructured data.” Using information provided in three fields—what, where, and when—Goby sorts, filters, and maps your results. While you can certainly use it to learn more about your local area, it’s especially helpful if, say, you’re taking a trip to admire the fall colors but need a few other points of interest along the way to jazz up your weekend getaway. 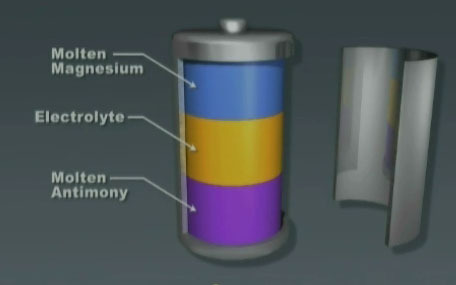 What's inside a liquid metal battery. The Newshour with Jim Lehrer Sept. 22 explored the work of two MIT professors who are wrestling with fundamental problems in renewable energy – how to make sure energy is available when the sun does not shine and the wind does not blow. New materials and the ability to scale up to massive megawatt storage are fundamental to the solution. Sadoway and his lab is experimenting with liquid metal batteries with new form factors. Professor Daniel Nocera, who works in energy and chemistry, takes a different approach. He and his lab use a well know method to split water into oxygen and hydrogen gas, but add a new catalyst to reduce the energy required in the process. Hydrogen stored with this method could be burned in a large fuel cell that could power a house or a small one to run a car, he says. This method is solves two major problems—storage and transportation— for what Nocera calls the Hydrogen Economy, the large-scale production and use of hydrogen as a fuel. For an undergraduate, it’s four and sometimes a little more, and for a graduate student, it’s one to who knows how many. It’s really not a long time, yet somehow we are all imprinted forever, as if we were just-hatched birds. The Alumni Leadership Conference was this past week, so I saw a lot of alumni in the Infinite Corridor, some young and some no longer young, but all highly imprinted and eager to learn how to be better at running an alumni club, raising money, interviewing prospective students, or expanding the reach of the Infinite Connection. That brass-rat-infested Infinite Connection has a wonderfully world-shrinking, sometimes surprising effect. When I was back in East Peoria, in high school, my good friend Allen Johnson and I used to enjoy chemistry experiments, mostly focused on failed fermentation efforts and on improving our not-so-good recipes for making gunpowder. Allen, whom I haven’t seen since high-school graduation, pitched up as a respondent to my Nightmare at the Center of the Universe piece, recalling the nightmarish occasion when he brought some real gunpower around. Amazingly, we weren’t killed by the experiment we performed, but we did blow quite a large hole in our workbench. Neither of us was seriously hurt, but Allen went into shock and thought he had blown his hand off. I was trying to concoct a good cover-up story when Allen’s parents showed up and dragged him off to the emergency room. Good thing they did; we didn’t know that powder burns call for tetanus shots—explosions can blow the tetanus bacteria on your skin right through into the meat. Maybe that was the imprinting moment that started Allen off on a path through law school and eventually into an environmental law practice. For me, it was the moment when I put gunpowder and Chemistry behind me in favor of a soldering iron, a few mild electric shocks, and Electrical Engineering. Anyway, I couldn’t think how Allen stumbled across the piece in the MIT alumni blog. Then, I learned he happens to be married to the evidently imprinted Susan Brody, M.S. in Urban Planning, MIT. World-shrinking Infinite Connection at work. Chef Paul Bocuse at the Bocuse d'Or. (© Owen Franken/Photographed for the New York Times, January 27, 2009). MIT alumni: They win MacArthur grants, develop groundbreaking video games, invent flying cars, and they take beautiful photos. One collection of photos, from the MIT Alumni Travel program, is accessible on Flickr. The most recent updates come from travelers who spent part of last month in Iceland and Greenland. Like what you see? Space is still available for several upcoming programs, including trips to Prague, South Africa, and Tahiti. View the full travel schedule by month or by region on the Alumni Association Web site.